New York City has countless delicious burgers, the trouble is picking between them when you are only there for a limited amount of time. At Loving New York we love a good burger and have therefore tried many of the cities famous patties. 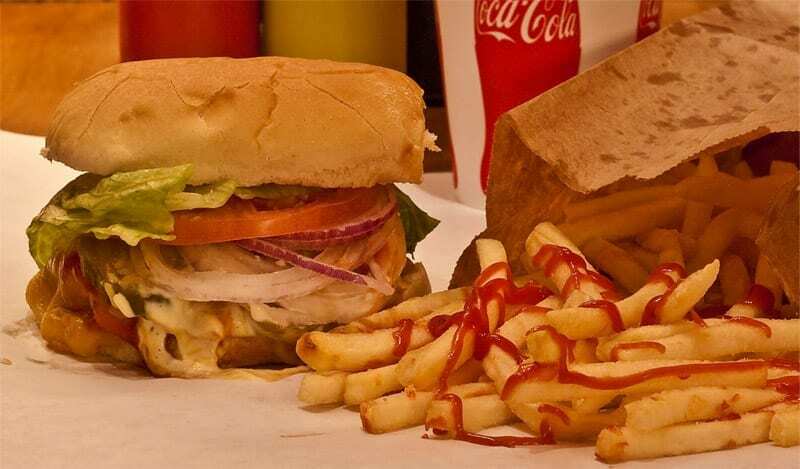 Below you will find out which burgers we personally rank as the best in the city. 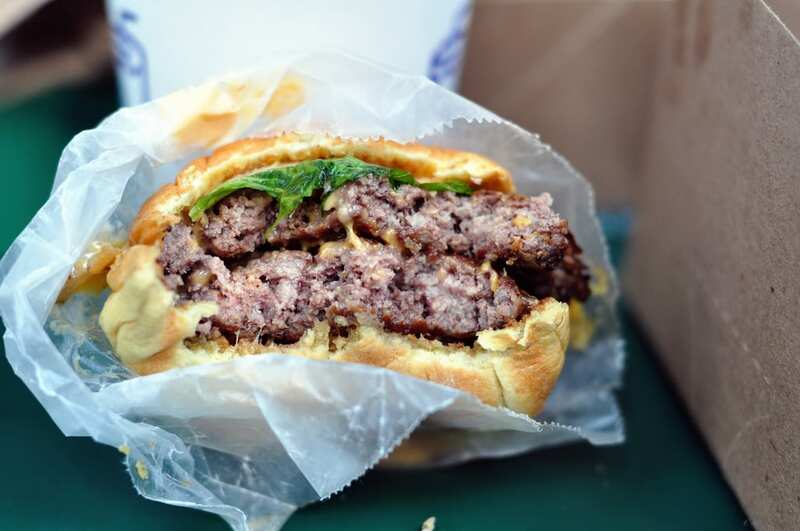 These are our top 7 burgers in New York City. The great thing about burgers in NYC is that there are so many of them. You will hardly find a restaurant, bar or grill that doesn’t serve its own version of the popular meat patty. 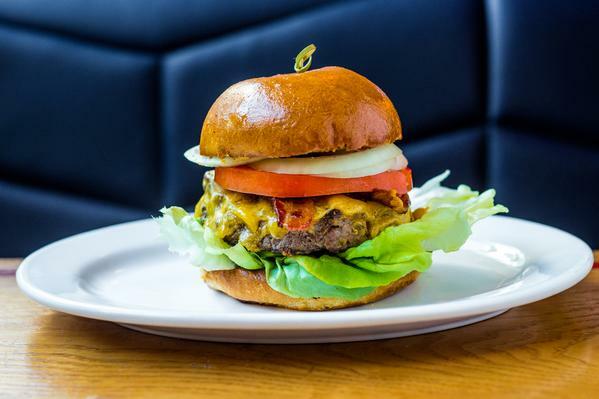 So that you don’t have to suffer through an average burger when there are far better ones out there, we have compiled a list of our top 7 burgers in NYC. We have to say, the competition for the 1st position was tough and would go as far to say that it was almost a 3 way tie! Our recommendation: try more than one of these burgers and find your own winner! Of course a list of the best is always going to be highly subjective, however, we make sure to check back with our fans regularly if we have missed a burger out there that you thinks outranks our choices. Let us know in the comments what your favorite burger is and why! We have ordered the list below by the taste of the burgers, which as you can see was extremely close and a very hard decision. We checked out the top 7 burgers on our list in greater detail to show you why they are deserving of the ranking we have given them. 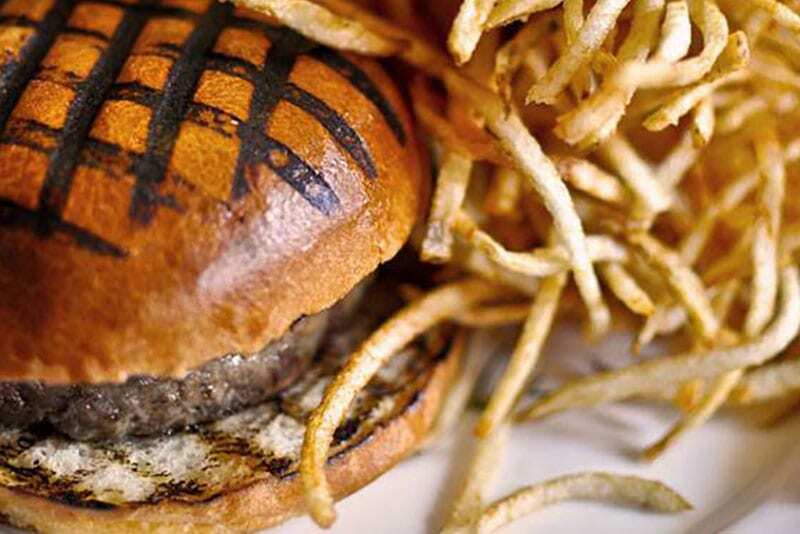 Check out the details of the best 7 burgers in New York City below. 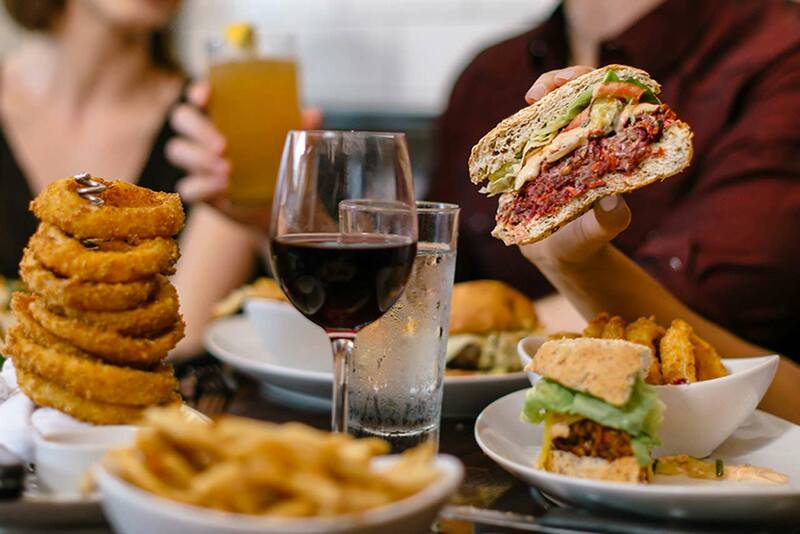 There are 4, locations of this amazing burger spot spread throughout NYC meaning that you are never too far from grabbing yourself one of the best burgers in the city. You can find a 5 Napkin in Hells Kitchen, the lower East Side, the Upper East Side, and one at Union Square. What makes their burgers so good? 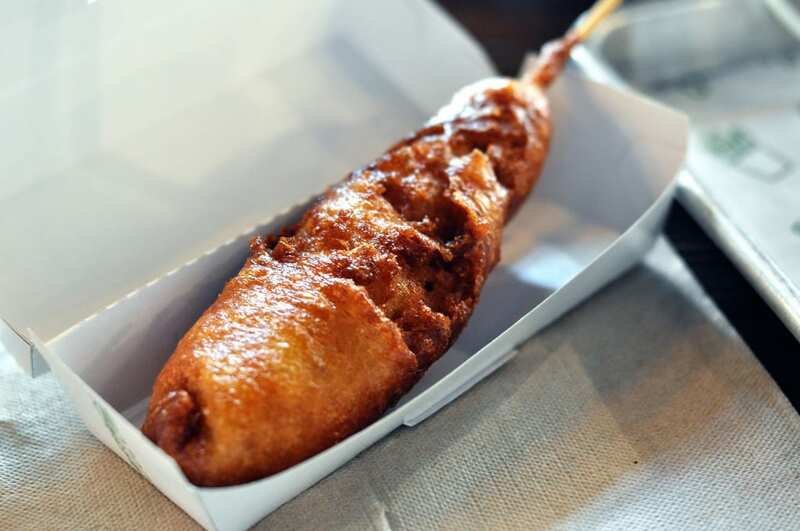 You will know the second you bite into one: they not only look good, but the meat is very juicy (hence the name: 5 napkins – that’s how many you’ll need!). That’s why the 5 Napkin Burger definitely has a place on our “best burgers in New York” list. We have eaten at the 5 Napkin restaurants many times times and so have tried a number of burgers. First, we always get the classic cheeseburger, so we can compare it to other cheeseburgers from other establishments (let’s call it a baseline). Following that, we try the specialty burgers – our favorite here was definitely the Bacon Cheddar Burger. 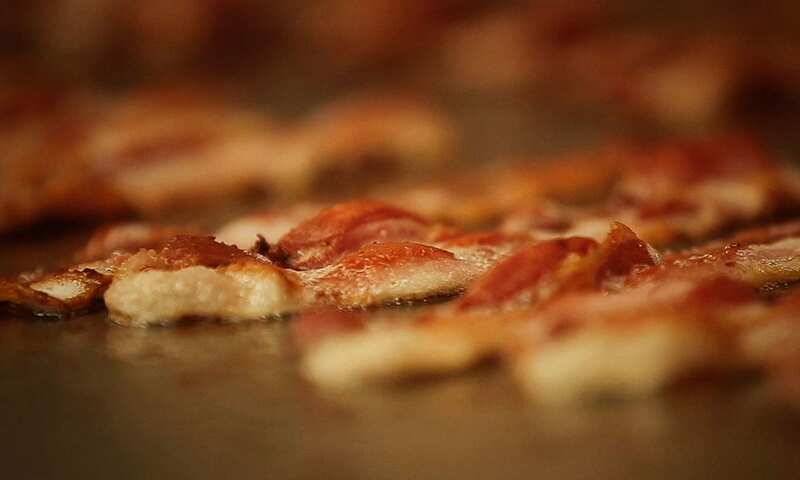 Crispy streaky bacon, great cheese, and crisp onions – Fabulous! The sides are really good as well. You can choose from guacamole (our recommendation) to hummus which is of course a safe choice – who doesn’t love hummus? 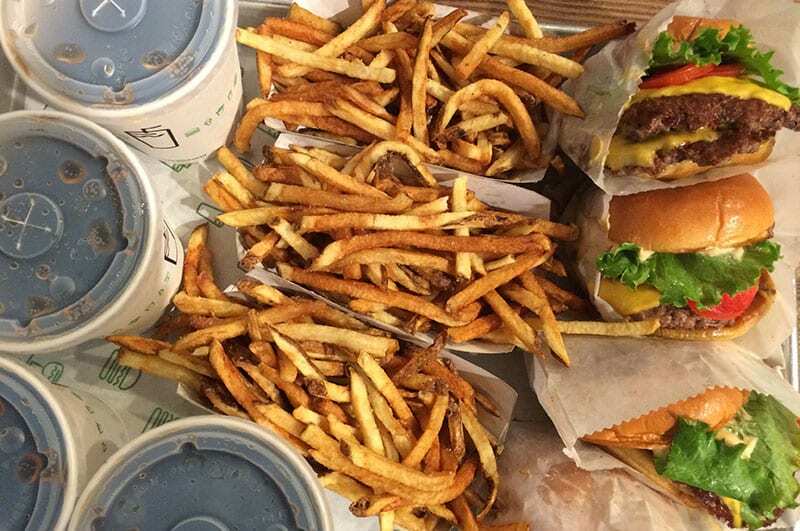 There are several Shake Shack locations throughout New York – their most well-known location is outside at the Flatiron Building in Madison Square Park. If you prefer to eat indoors, try their downtown location near One WTC, or their location in Brooklyn/Dumbo near Brooklyn Bridge. 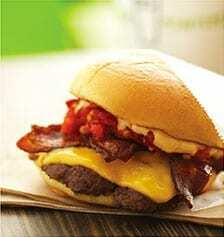 The burgers at Shake Shack are truly delicious. 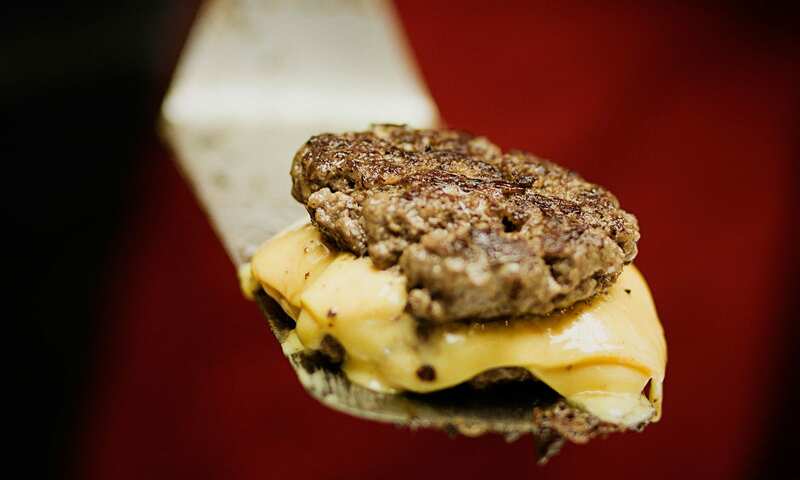 The key to the second best burger in town is its juicy meat that melts together with the cheese and their own (secret) sauce even before it reaches your mouth. Once you take your first bite you will notice that there is a perfect amount of each ingredient between the two fluffy and moist buns. Our tip: the Double ShackBurger! 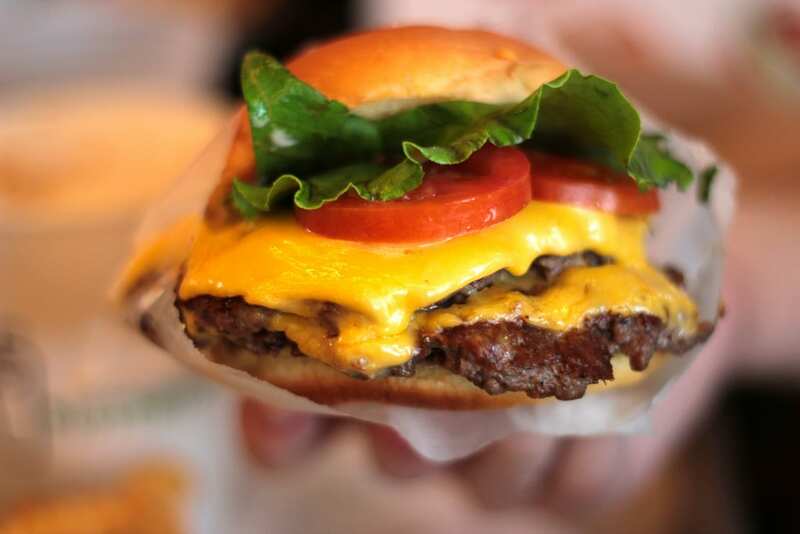 In our opinion, the Double ShackBurger is THE burger you need to try! That’s a cheeseburger with 2 patties. 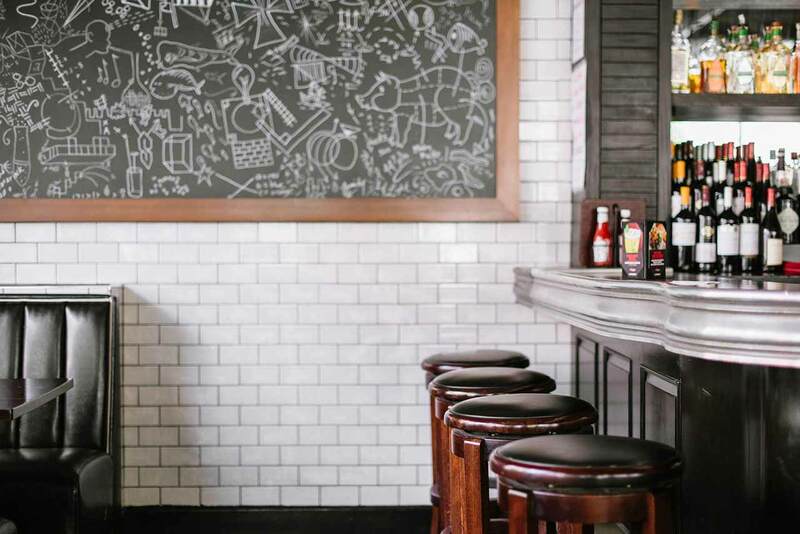 Bareburger takes a close 3rd on this list, especially due to its build your own burger type of approach. 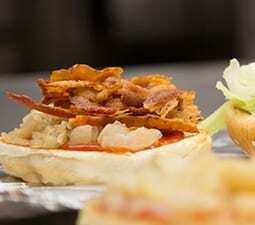 In 7 steps you can pick a type of patty, bun, cheese, bacon, veggies, sauce and spread. 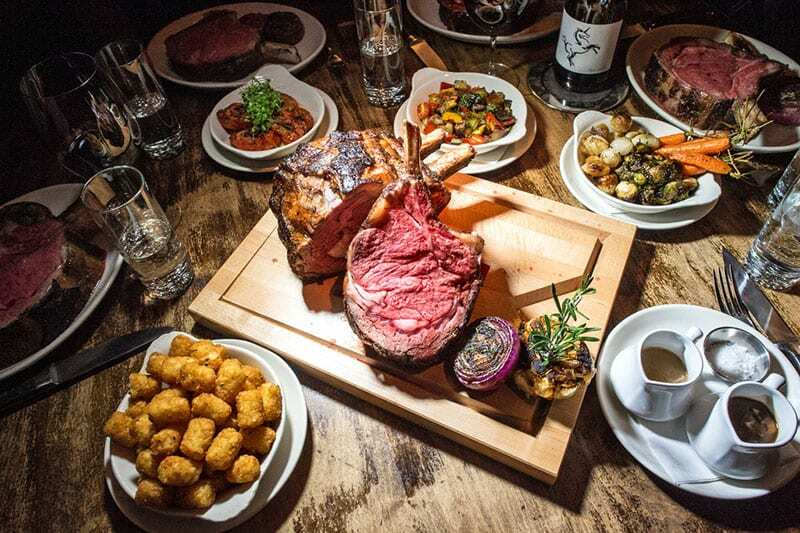 With 18 locations scattered throughout New York City you are also never too far from one. 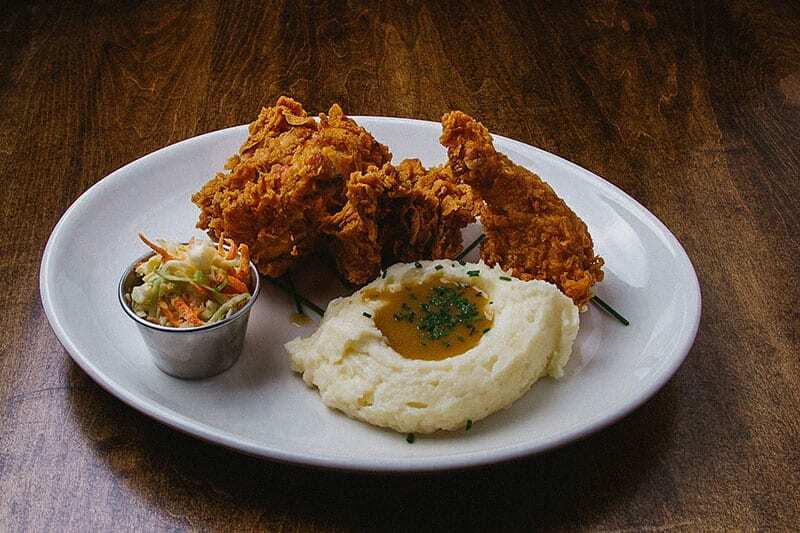 Our favorite is definitely the branch located at 155 Williams Street in Brooklyn close to the Brooklyn Bridge. 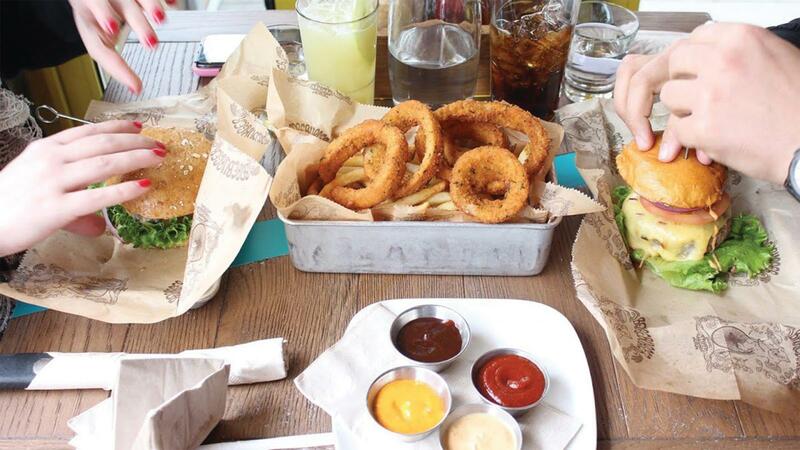 Another factor which puts Bareburger near the top of our best burgers list is its variety of meats. You can choose your patty made out of everything from qinuoa to wild boar, elk and duck! The sauces are also absolutely fabulous and offer a really unique taste to the burgers they serve. Everything is also organic making this place even more special. 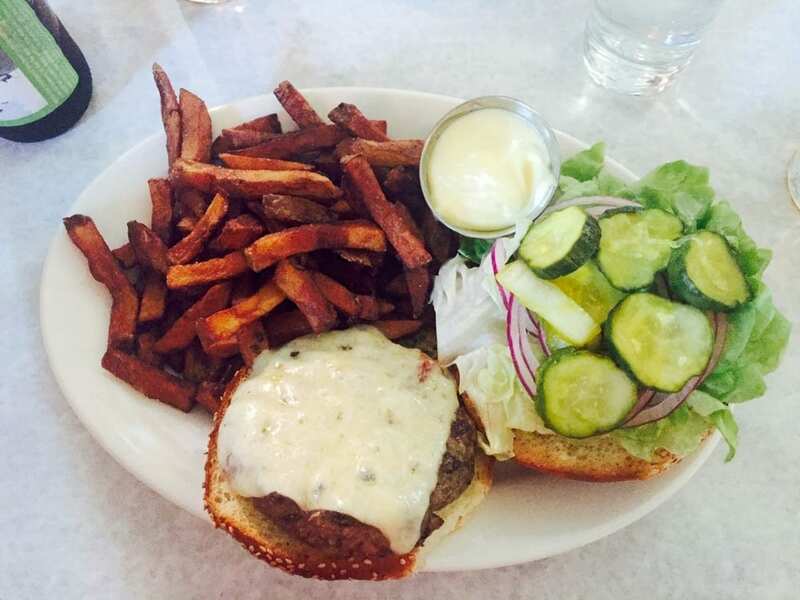 Our favorite burger is the Southern Caviar Burger, which consists of bison meat. 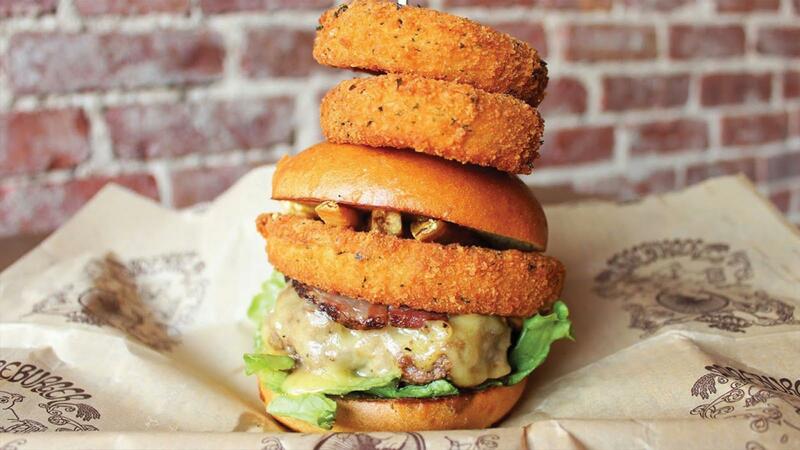 All this together makes Bareburger a shop that exists within its own league, burgers are perfectly balanced, although we highly recommend you get onion rings as a side to make sure you are full when you leave! 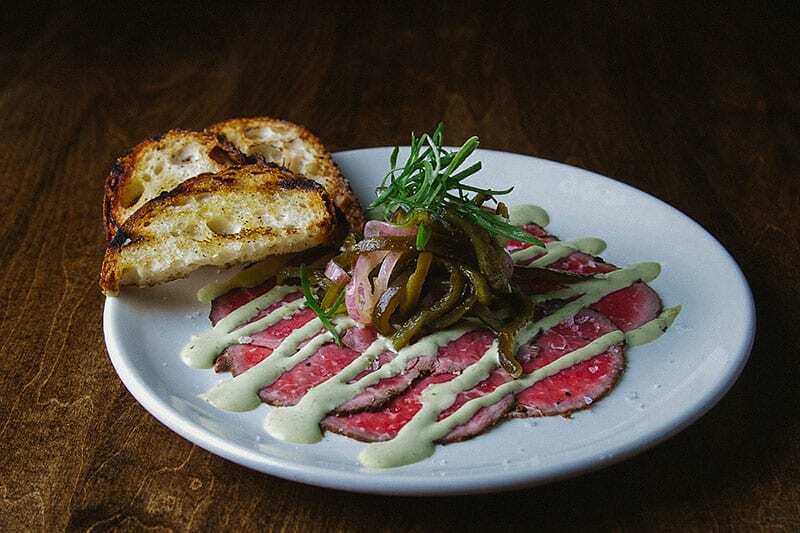 Burger & Barrel is an American pub that serves first class food and wine. It therefore makes sense that they call themselves a Winepub. The name also perfectly describes the atmosphere. 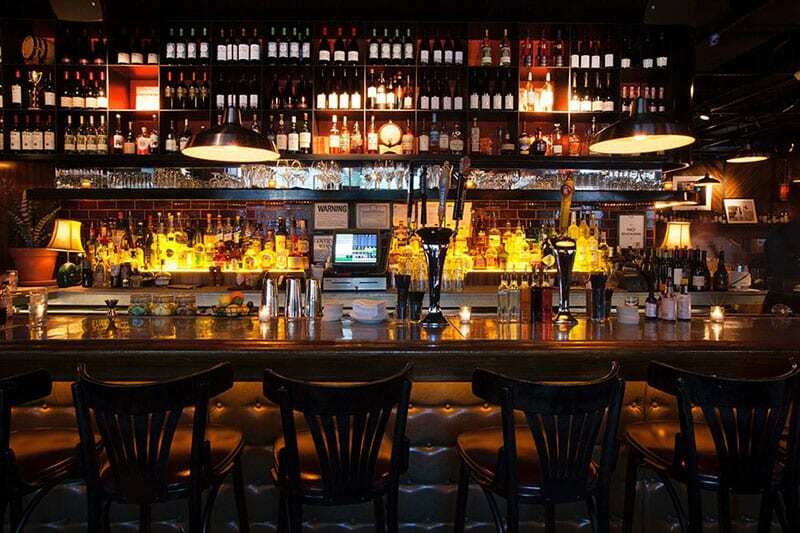 All the casualness of a pub has been combined with the glory and quality that comes with restaurants that serve great wine. 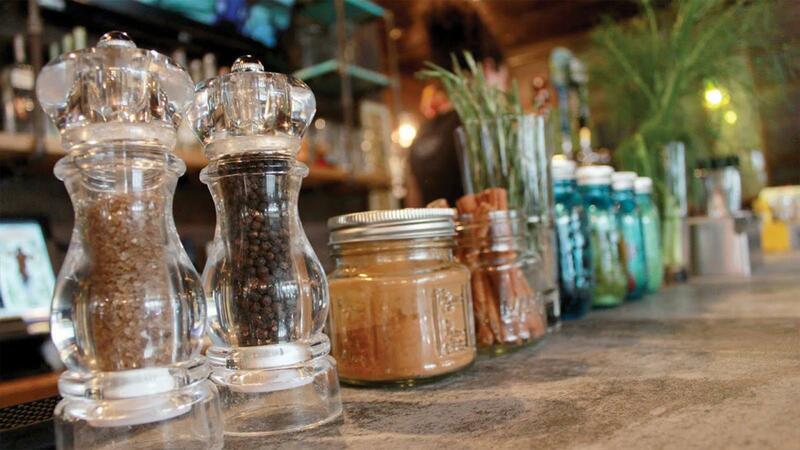 It is a classy yet basic, delicious yet simple kind of place. The same goes for it’s burgers. Our personal favorite burger here is the Bash Style Burger. It also happens to be the winning burger of the annual New York Food and Wine Festival! The B&B team has won this category not just once, but 5 times! Even if you are not in the mood for a burger, stop in at this restaurant (reservation recommended!). 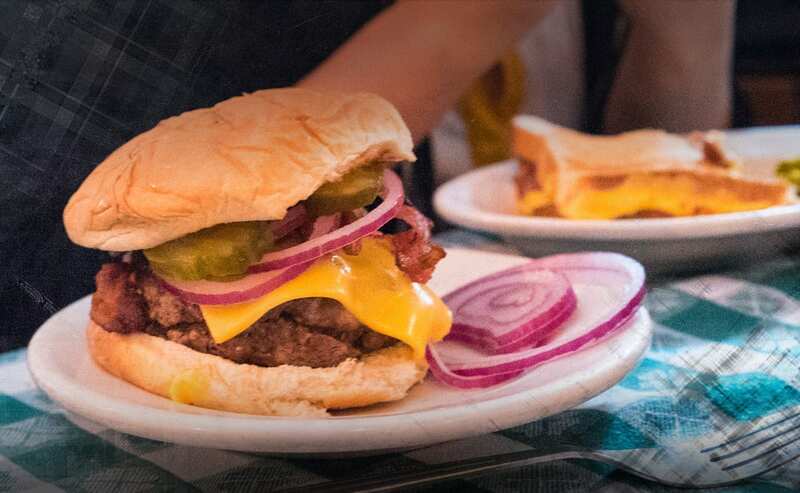 The Bash Burger is made up of onion & bacon jam, pickles, American cheese & special sauce. The burgers highlight is definitely the onion and bacon jam which adds the perfect level of smokey sweetness to the deliciously cooked meat. 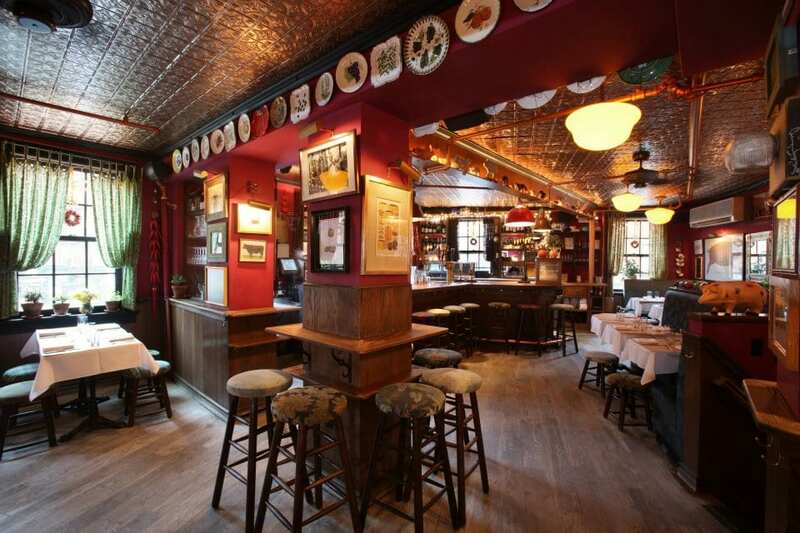 We had heard about the Minetta Tavern long before we finally decided to pay it a visit. 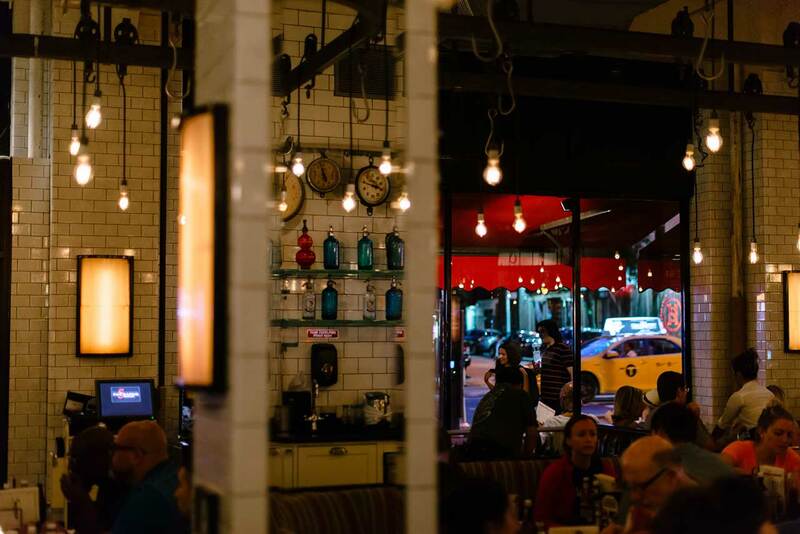 From being featured in several documentaries to many recommendations from friends and family we had heard about The Minetta Tavern many times. 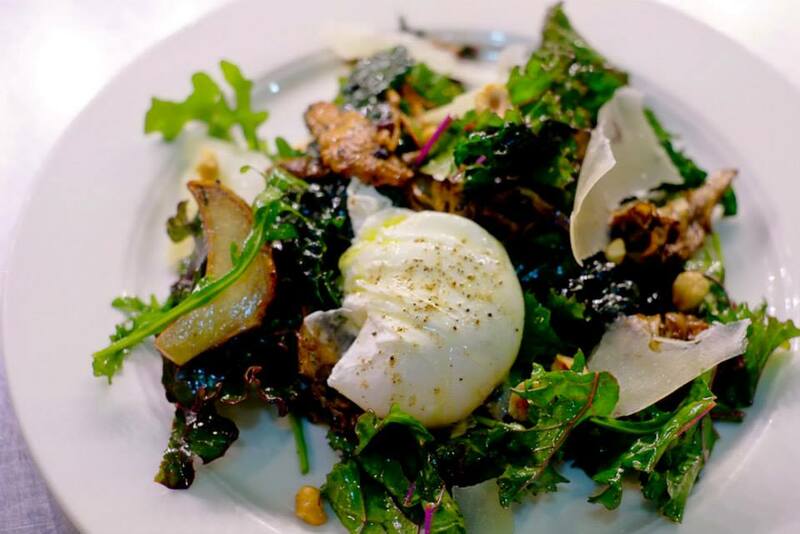 The restaurant is inspired by French cuisine and specializes in high-end cooking. However, during our visit it wasn’t their selection of sensational steaks that caught our eye, but the Black Label Burger. While the price is steep for what looks like a simple burger, the flavor combinations make this burger worth every penny. The burger is served with a tomato, caramelized onions, lettuce and a side of fries and a pickle. The black label burger was juicy and full of flavor. 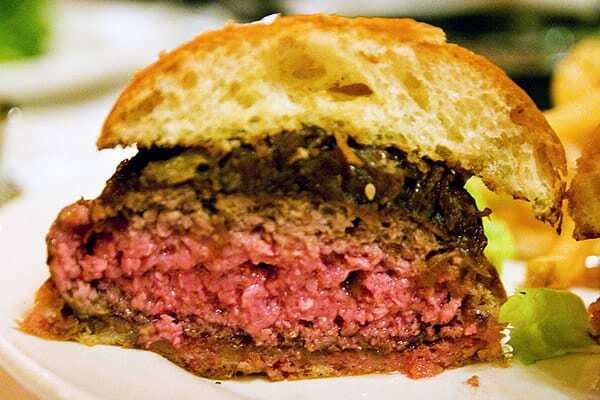 The perfectly seared outside of the patty gave way to a pink, beautifully cooked, juicy interior. The meat is so tender it melts on your tongue combining perfectly with the fluffy bun and crispy leaf of lettuce. 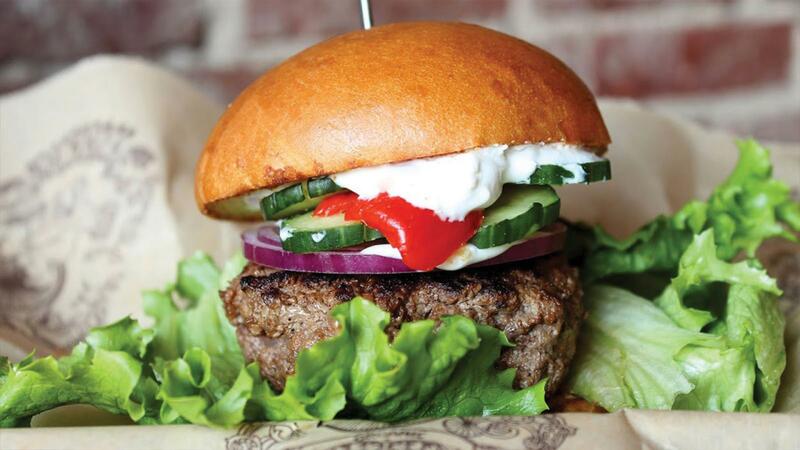 If you want a burger that is purely focused on the meat, this is it! No cheese, no sauce, and this burger still activates every last tastebud in your mouth. This, ladies and gentlemen, is the king of the beef patties we have tried so far. Definitely try some of the bone marrow as a starter, together with the burger this will make for an expensive but perfect meal. 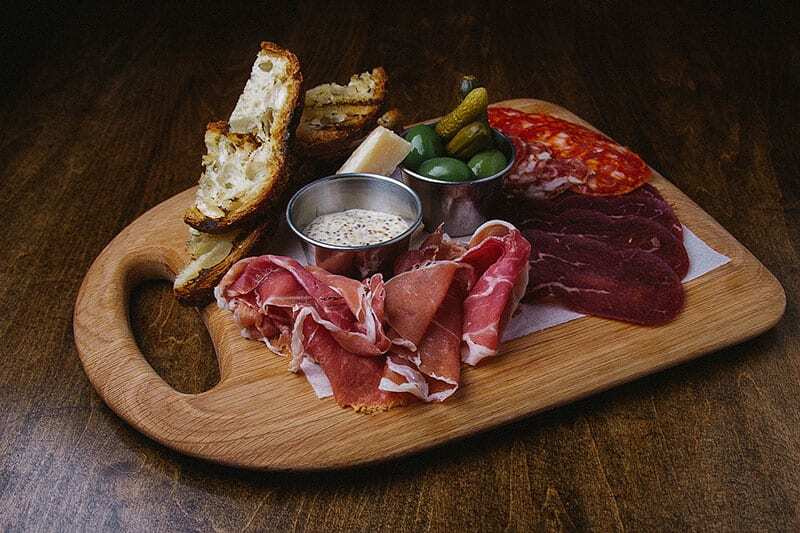 We first heard about the Spotted Pig as we are big fans of Jamie Oliver. 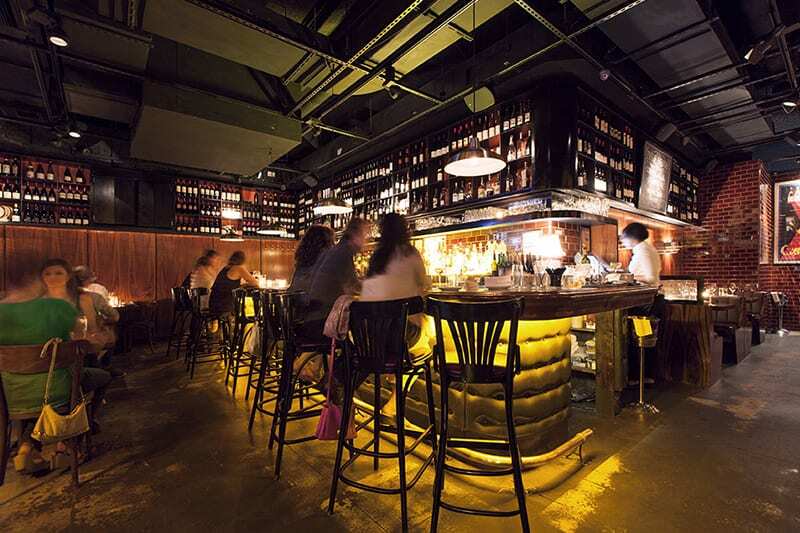 One of his friends who he also used to work with, April Bloomfield, co-owns this restaurant. The place has got style and has even been awarded a Michelin Star! All of the above made sure that we absolutely wanted to eat here once. 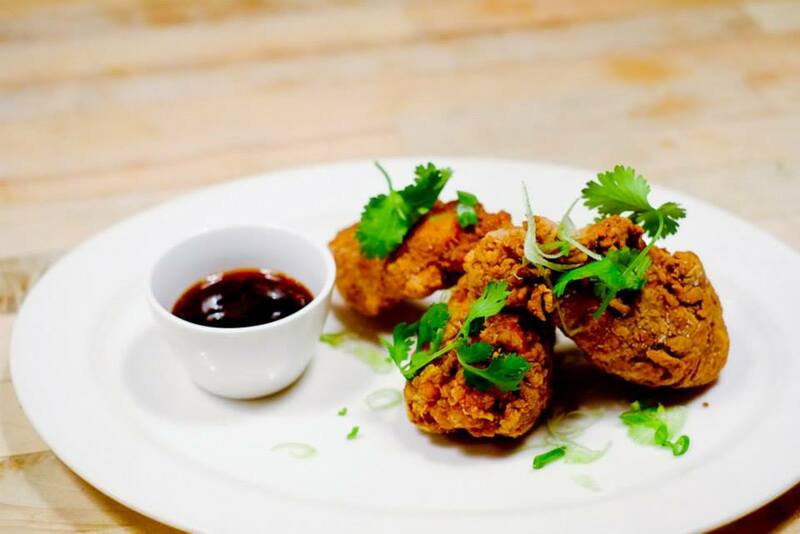 Their signature dish is the first thing we went for on the menu and we were not disappointed. The burger with Roquefort cheese was an absolute delight. The blue cheese combines with the meat perfectly and makes the juicy burger something you will remember when you bite into burgers for a long time. The skinny fries on the side were a nice change, however personally I didn’t think they were crispy enough. The whole experience of the restaurant was great, despite the casual atmosphere the food was top notch. We highly recommend this place and not just for burgers. The other dishes on the menu were delicious, each deserving of a Michelin star in its own right if it were down to us. 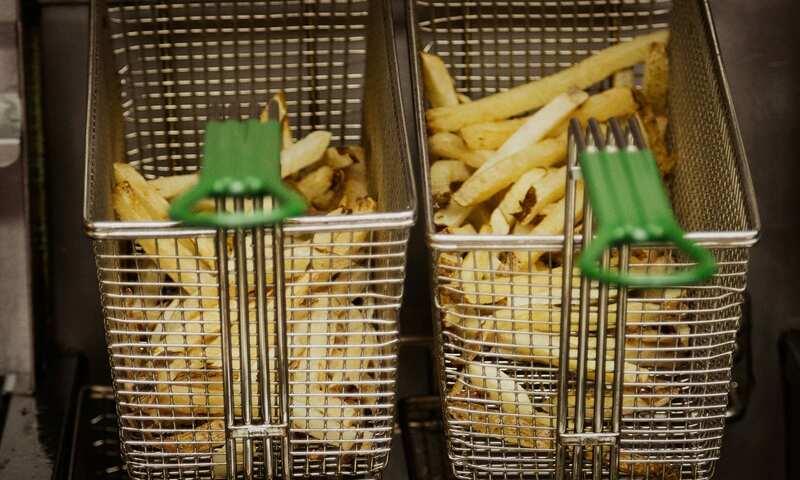 5 Guys Burger and Fries has now become a very popular fast food chain around the world. Good ingredients are the basis of their success and give their burgers a great taste despite being classed as fast food. There are over 10, 5 Guys restaurant in New York meaning that you can always be sure that one is not too far away. Click here for a map of their locations. It is important to note that all burgers at 5 guys are served well done due to their regulations. However, we have found this to not be a problem, 5 Guys manage to retain both flavor and juiciness in their patties and there burgers are first class. This is in large part thanks to the excellent meat they use. Even though this may sound surprising: the small burgers are our favorite here. Especially the Little Bacon Cheeseburger. 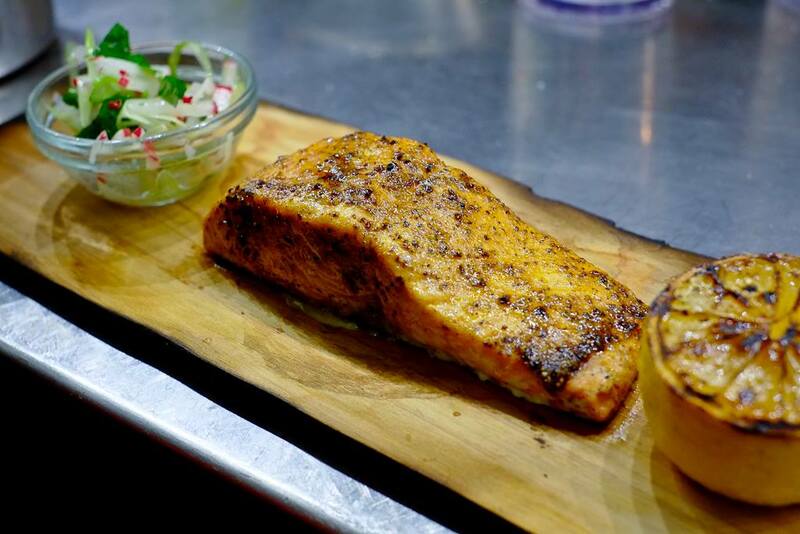 Small, juicy, delicious – simply brilliant. Be sure to order the Cajun Style Fries as a side as they have just the right amount of spiciness and are a perfect companion to the burger! Overall we were surpised to be including a fast food chain in our top burgers of the city, we have found however that few places match their quality. 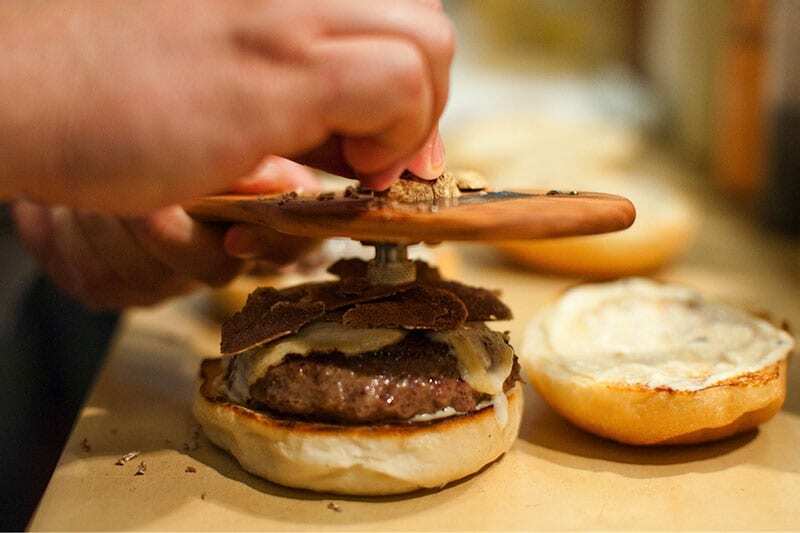 The key is that the burgers are perfectly balanced, with each bite you take you can taste each ingredient separately. The tastes combine while you are chewing into the perfect combination of grilled beef, cheese, and your choice of toppings. These burgers are truly something special. 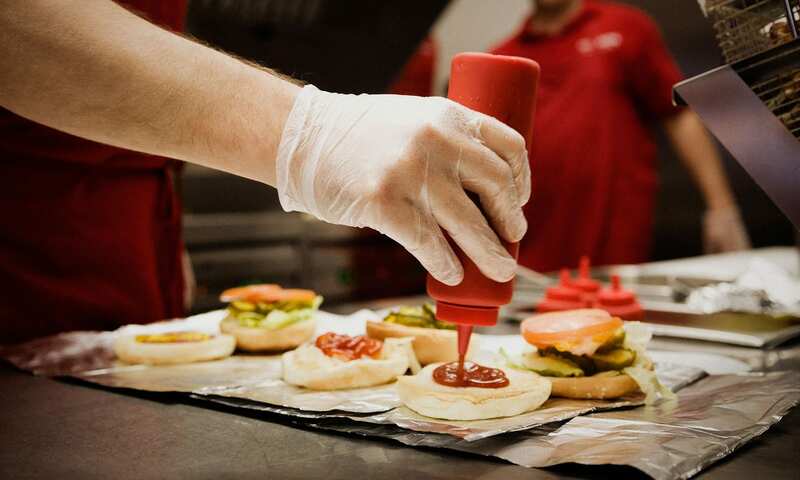 It also helps that 5 Guys all have an open kitchen, the anticipation to take a bite while you see your burger being made makes the whole meal a sensation tingling experience.